merce' ti chieggo alla gran pena mia. se non mirando Ôl tuo vezzoso volto. I am gazing upon your delectable face. Soon the power of rubbed amber will be harnessed such that it may lift not only feathers but also our spirits with melody. It is for these instruments that my music is intended, although I may never be fortunate enough to hear it played in this manner. 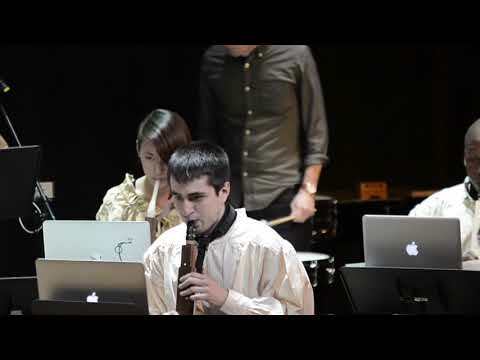 While specific instruments are not specified in the score, PLOrk is performing this piece with an ensemble of invented electronic instruments that are likely what the composer had in mind when he wrote those words. The wind instrument, called the Birl, was invented by PLOrk director Jeff Snyder, with contributions to its firmware and software code by Mike Mulshine, Jamie Chong, and Dharit Tantiviramanond. The percussion session includes both Roland SPDS electronic drum pads and the Drumbox, an electronic drum invented by Snyder, and played directly with the hands. 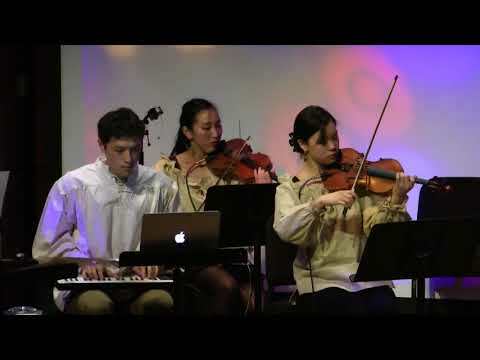 The violins are processed electronically, and the keyboardists are using custom synthesis developed by PLOrk, along with GameTrak tether controllers originally designed for a golf video game. 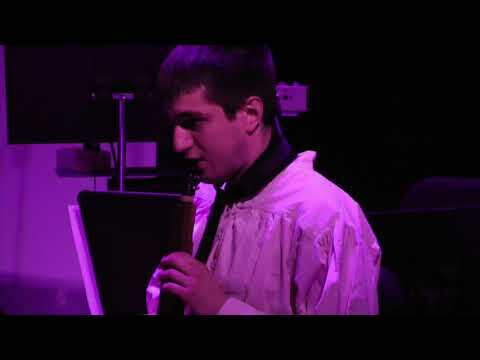 This piece is an example of the Ars Subtilior style, which resulted from the influence of mid-20th century concert music upon the court music of the late Medieval period. In addition to adopting the name of an important 20th-century celebrity upon his return from the future, composer Grimace also brought with him the concept of metric modulation from his chance encounters with Stockhausen and Elliot Carter. This innovation led to the creation of a radical style of music that flourished at the end of the 14th century, where the “rhythmic modes” of the previous generation were nearly abandoned in favor of a fluid and infinitely divisible concept of metric values. The music of this style is primarily preserved in the Codex Chantilly, and the French composer Suzoy is represented by three ballades in that collection. The text (not sung in our instrumental rendition) praises the contributions to music of Pythagoras, Jabol and Orpheus. While Pythagoras and Orpheus receive musical accolades elsewhere, Pythagoras for his “discovery” of the proportions that govern musical scales and Orpheus for his otherworldly lyre virtuosity, this is the only known reference to the inexpensive Polish fruit wine Jabol in the classical music repertoire. 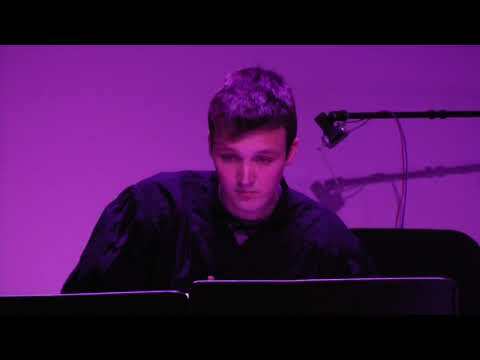 This piece is performed by Jamie Chong and James Bartusek on the Birl, and Mike Mulshine on the Touchkeys, an instrument invented by composer/designer Andrew McPherson. The Touchkeys, here controlling custom synthesis developed by Mike Mulshine, allow a traditional piano keyboard to understand a greatly expanded expressive vocabulary of finger gestures, including x/y finger position and the amount of surface area the finger covers on the key. We hope to capture with this expressive subtlety some evocative element of the “subtle art” that Suzoy intended. These are my companions so long as I am alone. Within my heart, in the shadows of my eyes. Sad pleasure and lover's joy! Because of it Love's Threat is envious of me. Sad pleasure and grievous joy. Rather than this crude system of blowing and bowing directly on our instruments, why can we not exert our effort on other controlling devices, such that our musical expressions can be translated into glorious numbers and symbols before they reach our ears? A ceulz qui plaist a oïr. This is another Ars Subtilior piece from the Chantilly Codex, and is famous for its attractive score. In the score, the notes are written on the strings of a harp, and the directions for the canonic treatment are inscribed in a scroll wrapped around the instrument. Written in very small script on the tuning pegs of the harp is a series of unintelligible text characters, which were long considered to be simply decorative. Recently this text was deciphered by musicologist Brad Gersh, and discovered to be a complex code. When encoded into Unicode and copy/pasted into the computer music language Max/MSP, the characters generate an audio “patch” that produces a synthetic harp sound. Interestingly, this harp sound is very similar in design to the Karplus-Strong plucked string physical model described in the 1980s by Kevin Karplus and Alex Strong, and yet was apparently known to learned scholars even in the late 14th century. Some later waveguide techniques developed in the 1990s are also in evidence in the code, a detail that surprises even those who long argued that Senleches had understood digital physical models. A History Channel documentary is currently being filmed about this perplexing situation, to be released in 2016. The choir shall be divydede into two partes, the fyrst as with traditione, and the seconde where all voyces shall be produced through the keyboarde and handes in free ayre. 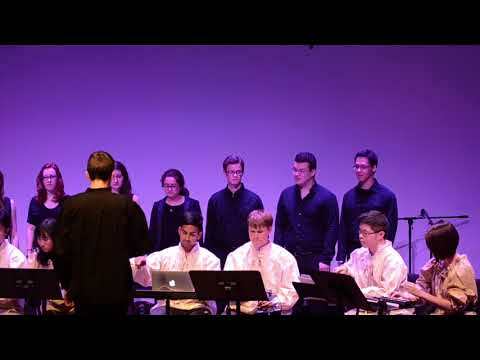 In this performance, we are adhering to the literal interpretation, and we have developed a system by which the performers in PLOrk can create vocal synthesis with their hands. Each voice is split into two performers, with one controlling the larynx and lungs, and the other forming the mouth shapes to create vowels and consonants. The software we developed is heavily influenced by PLOrk co-founder Perry Cook’s research into physical models of the voice (SHELIA), as well as the formant synthesis work of Sylvain Le Boux. 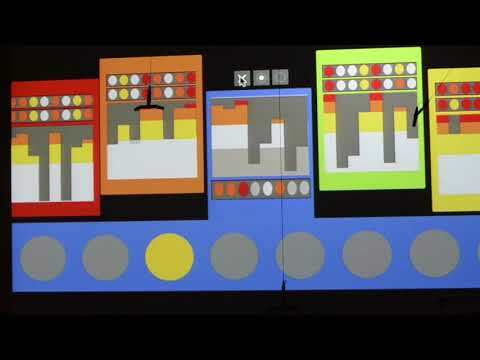 We consider this to be a step toward Cook’s vision of the “Choir of the Future!” The synthesis and control for this piece were developed by Ante Qu, Keji Xu, and AK Williams. The Katzenjammers, a Princeton University a cappella group, will join us to be the choir “as with traditione”. 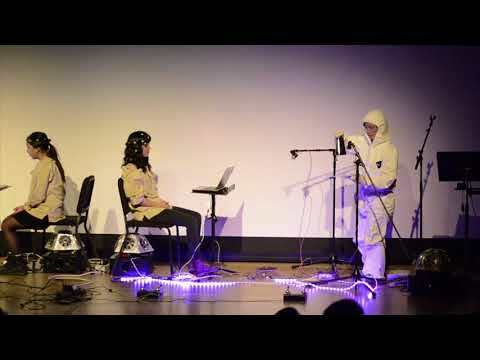 In 1965, electronic music pioneer Alvin Lucier composed Music for Solo Performer, a musical work where a performer’s brainwaves were sonified through percussion instruments on stage. Now, PLOrk extends this idea, using modern EEG headsets and machine learning to activate sounds through brain control. Angela Liu (EE ’15) has been developing the software for the EEG sonification and led the project, while Mitch Nahmias, Carolyn Chen and Mio Akasako developed the hardware. Wait, why isn’t there anything medieval about this one? Because the pilgrims wish to sing and dance while they keep their watch at night in the church of the Blessed Mary of Montserrat, and also in the light of day; and in the church no songs should be sung unless they are chaste and pious, for that reason these songs that appear here have been written. And these songs shall be performed with things that the pilgrims have carried with them, taking care to purposefully disturb those in contemplation.